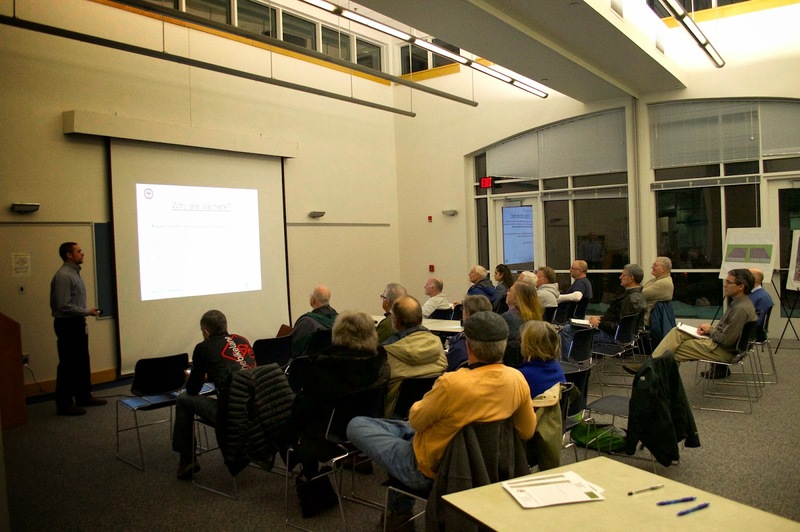 Several cyclists attended the meeting last night on proposed bike lanes on Burke Road and Shiplett Boulevard. Supervisor Herrity and Planning Commission Chairman Murphy were also there. On both roads, lanes would be narrowed to allow striping of bike lanes for long sections of the roadway. Such treatment is known as a "lane diet." Where not enough room is available for bike lanes, shared lane markings, "sharrows," would be used. One person expressed a concern about cost and it was pointed out that since both roads will be repaved, changing the striping pattern to include bike lanes has a minimal impact, if any, on the cost of the project. There is a lot of pent up demand for better bicycle and pedestrian facilities in the area. Several people noted that without sidewalks, people are often seen walking on Burke Road. Burke Village Center is located nearby. Others talked about the need for trail maintenance, especially snow clearing on popular trails. 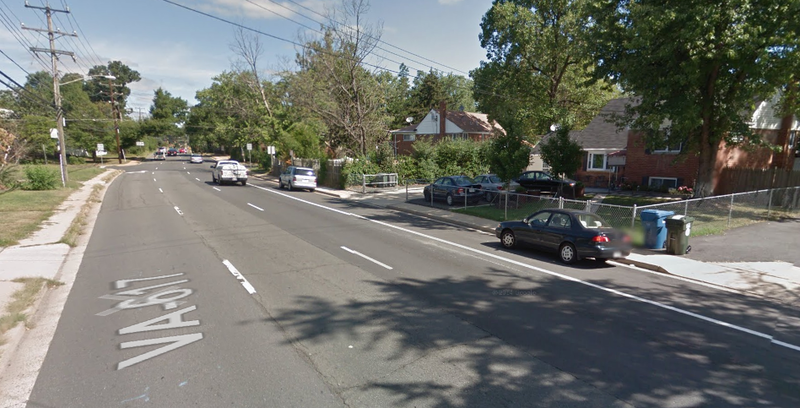 In the image on the right, the red section of Burke Road will be striped with bike lanes. The other sections will likely have sharrows. A few people were concerned that the sharrows would encourage inexperienced cyclists to ride on a dangerous road. Others wanted the sharrows to warn motorists to expect cyclists and help prevent motorist harassment of cyclists. The red section of Shiplett will be striped with bike lanes. The blue, green, and yellow sections will have a climbing lane in one direction and various options for wide shared lanes with sharrows in the other direction. There is not enough room for standard bike lanes on both sides. The presentation will be posted on the county bike pages in the near future. Update: Cyclists are encouraged contact Supervisor Herrity and/or Adam Lind to show your support for these projects. Fairfax County is holding several budget town hall meetings over the next month. Cyclists should consider attending one or more of these meetings to speak out for funding for implementation of the Bicycle Master Plan. The plan was adopted in October and includes several ambitious goals for building new bike facilities and encouraging more people to take short trips by bike. The Board of Supervisors is committed to funding some major bike projects, including several as part of the 2014 Transportation Bond. Physical infrastructure (Engineering) is only one part of what it takes to become a bicycle-friendly place. Encouragement, Education, Enforcement, and Evaluation, the other 4 E's, are also needed, and there is almost no funding for these activities in this year's budget. The county needs funding in order to support activities such as Bike to Work Day, Bike to School Day, bicycle safety education for children and adults, motorist education, a bicycle counting program, and other programs. It doesn't take much money; it takes a commitment on the part of the county to make these activities a priority. Cyclists are encouraged to attend these upcoming budget meetings to ask the county to start now to implement the Bicycle Master Plan. While adoption of the plan was a major achievement, we don't want it to sit on the shelf, and funds are needed for those other activities. You can also sign up to speak at the Board budget hearings April 7-9. See the county budget page for more info. Springfield District Budget Meeting West Springfield Government Center - 6140 Rolling Road, Springfield - Community Room Wednesday, March 18 - 7:00 p.m.
Mason District Budget Meeting Mason District Government Center, 6507 Columbia Pike, Annandale - Main Community Room Thursday, March 19 - 7:00 p.m.
Lee District Budget Meeting Franconia Government Center - 6121 Franconia Road, Alexandria Wednesday, March 25 - 7:00 p.m.
Sully District Budget Meeting Rocky Run Middle School - Cafeteria - 4400 Stringfellow Road, Chantilly Wednesday, March 25 - 7:00 p.m.
February 11th was celebrated as Crossing Guard Appreciation Day in Virginia. And it was also the opportunity for VDOT's Safe Routes to School program to recognize Virginia's Most Outstanding Crossing Guards of 2014. Over forty crossing guards were nominated this year with six being recognized by VDOT. Those crossing guards routinely go above and beyond what is expected and are standout members of their communities. Two of the six recognized were from Fairfax County. FABB appreciates all the work they do as part of normal walking and biking to school and their help during International Walk to School Day and National Bike to School Day. Edie Adcock has been a crossing guard at Wolftrap Elementary School for 29 years. That equates to over four generations of completely new students who have been guided safely across Beulah Road by Ms. Edie, as she is affectionately known. She is a fixture in the mornings and afternoons, and a friend not just to the students but also the parents, caregivers and others who walk their children to school. She even recognizes parents she crossed 20 years ago. Since 2009, when Wolftrap started its SRTS activities, Ms. Edie has supported us by being a key part of monthly bike trains, weekly Walking Wednesdays and annual Bike/Walk Challenges. During “Snowmageddon” she provided boots-on-the-ground input to move the Kiss-N-Ride, which improved safety by an order of magnitude. She also worked with the bus drivers when this past fall's traffic situation was compounded by new instructions from FCPD. Her biggest joy is when the monthly bike train rolls by; and how she stops all traffic for every rider on it, be it a trio of riders or a massive group of over 50. Wolftrap is a better and safer place as a result of Ms. Edie’s daily presence. Following too closely - This bill changed a single word in existing law so that motorists are not allowed to follow too closely behind another vehicle, including a bicycle, not just another "motor" vehicle. If signed by the governor, the new law would not prevent a bicyclist from following another bicyclist closely as in a paceline. Passing with a double yellow line - The law will allow a motorist to pass a bicyclist when there is a solid yellow line on their side of the road. The original bill was modified to apply to both a double yellow line or a single solid yellow line on the driver's side. Here's the full recap from Virginia Bicycling Federation. Thanks to VBF for their hard word during this session, attending many early morning committee meetings to testify and track several pieces of bike-related legislation. A special thanks to VBF's Bud Vye for his work during the session and for providing periodic updates on the status of various bills. Fairfax County Planning Commission is updating the Tysons Comprehensive Plan. The Commission has completed proposed changes for Phase 1 (Implementation, Land Use and Urban Design) and Phase 2 (Transportation) and is currently working on Phase 3 (Parks, Public Utilities, and other Updates). The latest Phase 3 draft text was recently released. Among proposed changes is the "Green Artery" trail, a linear park linking the four new Metro stations "that could weave under and along the Silver Line." This trail was one of the ideas that came out of a June 2014 design session convened by Chairman Bulova to look at ways to spruce up the area under the elevated Metro tracks. This proposed trail would be in addition to a planned circuit trail included in the Tysons Park System Concept Plan approved in November, 2014 and bicycle facilities contained in the Bicycle Master Plan. While these facilities will take many years to implement, they will have a major impact on how future residents will be able to get around Tysons by bike and on foot. The Green Artery trail is especially important since almost all future development in Tysons will be focused around the new stations. The Planning Commission's next meeting on Phase 3 updates is scheduled for Wednesday, March 11 at 7 p.m. See the Tysons Comprehensive Plan Amendments page for more information. Public hearings on all changes contained in Phases 1-3 are expected to be held later this year. Trail Network: The conceptual trail network is included in Map 9. This network will be designed for frequent use through continuous lengths of outdoor trails or spaces that are a minimum of eight feet wide and may include amenities and/or design features such as trailheads, orientation features and wayfinding signage. These linear parks and trails will be popular for jogging, dog walking, biking, walking, enjoying the outdoors and general exercising. The space along the Metro rail provides an opportunity to create a “Green Artery” linear park to link the four stations with a pedestrian and bicycle path that could weave under and along the Silver Line. Connecting continuous linear spaces with the grid of streets in Tysons provides an important amenity that can be linked with pedestrian and bicycle street elements. The County will pursue lighting of certain trails that provide Metro access and will consider other services to keep trail access open during winter months. The “Tysons Community Circuit” recreational trail loop as proposed along existing and planned roads will be a combined recreational and transportation feature that will add to the diversity of options available for moving through Tysons. The Tysons Park System Concept Plan describes features of and implementation strategies for “The Circuit” in greater detail. 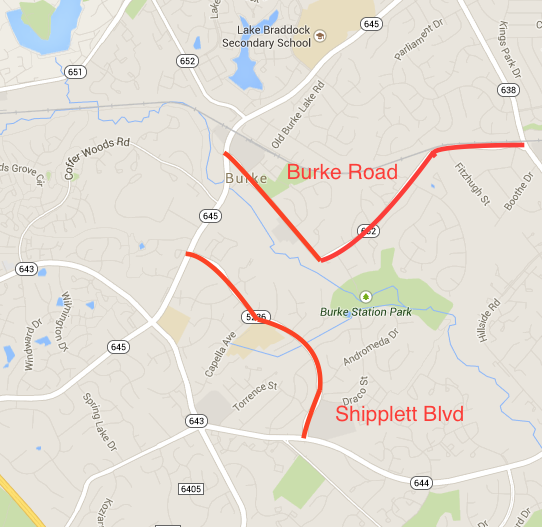 Fairfax County is holding a meeting on proposed bike facilities on Shiplett Boulevard and Burke Road on Thursday, February 26. This meeting is one of a series of meetings on planned bike projects to be implemented as part of the summer repaving schedule. 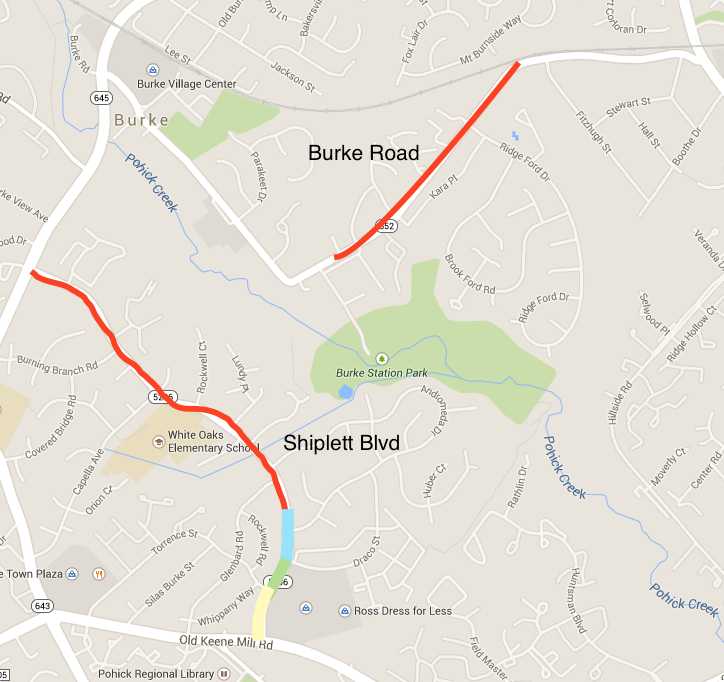 Bike lanes are being proposed on Shiplett Boulevard from Burke Lake Road to Old Keene Mill Road AND on Burke Road from Burke Lake Road to Rolling Road by reducing roadway lane width, known as a "lane diet." No roadway widening is anticipated. The meeting will be held on February 26 at the West Springfield Community Center, Community Room located at 6140 Rolling Road. The meeting is scheduled to begin at 7 p.m.
Cyclists are encouraged to attend to support these projects. While there should be little or no opposition, it helps to have cyclists present to voice their support. Please consider attending. See an earlier FABB blog posting about funded projects. On a related note, see an earlier presentation on the proposed road diet on Kingstowne Village Parkway. Update: The Liberty Bell Trail is scheduled to be completed this year and would connect to bike lanes on Burke Road, providing another incentive for more people to use bikes to get to the VRE station and for other short trips. See an earlier FABB blog entry about the Liberty Bell Trail. The House Transportation Committee will meet tomorrow to vote on two major bike-related bills, the bill to allow motorists to cross the yellow line when passing a bicyclist, and maybe the bill to require motorists to avoid opening their door when a cyclist is passing. If your representative serves on this committee, please contact them and ask for their support. You can also contact Delegate Rust, chairman of the committee, to ask for his support. Allows drivers to cross a yellow line to pass a pedestrian, stopped vehicle, bikers, etc., if safe to do so. Current version modified to include single yellow line on driver's side. Requires motor vehicle operators to wait for a reasonable opportunity to open their door. Was not recommended to be reported by the House Transportation Sub-Committee (4-3) on Monday, 2/16 , but the Sponsor, Sen. Chap Petersen intends to request reconsideration in the full House Transportation Committee at 8:30 AM Tuesday. Thanks to Jim Durham of Alexandria Bicycle and Pedestrian Advisory Committee for sharing this information, and to Virginia Bicycle Federation for reporting on progress in today's session. Fairfax County is holding an information meeting on February 18 on proposed bike facilities on Kingstowne Village Parkway in the Franconia-Springfield area. The county is proposing a road diet, changing the road profile from 2 lanes in each direction to 1 regular and a bike lane in each direction with a center turn lane, similar to Lawyers Road in Reston. Cyclists are encouraged to attend the meeting to learn more about the project. Join Fairfax County DOT to discuss proposed improvements to multimodal safety on Kingstowne Village Parkway from Beulah Street to Hayfield Road at a meeting on Wednesday, February 18. 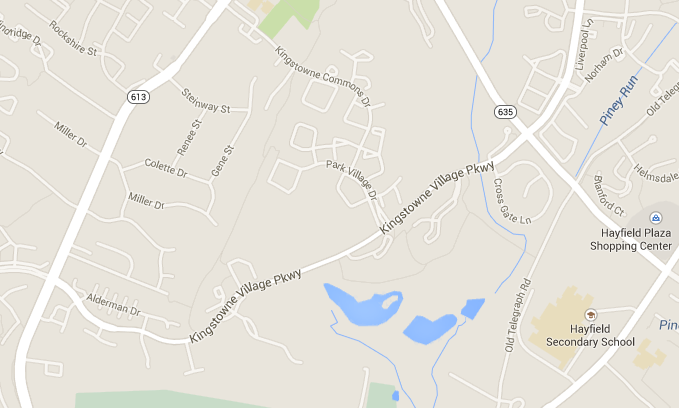 This project is being proposed in conjunction with Virginia DOT’s 2015 summer repaving of Kingstowne Village Parkway. The section proposed for multimodal safety improvements extends from Beulah Road to Hayfield Road. The meeting will be held at Kingstowne’s Thompson Center located at 6090 Kingstowne Village Parkway, beginning at 7 PM. 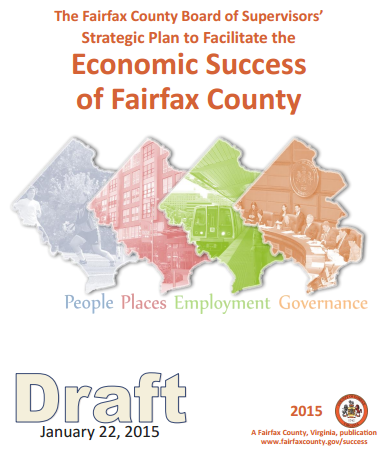 Fairfax County is updating it's economic strategic plan. Public outreach meetings were held last summer and fall and the county Economic Advisory Commission put together the final draft, a Strategic Plan to Facilitate the Economic Success of Fairfax County, that was presented to the Board of Supervisors on January 27,. We are encouraged by the strong support for bicycling and multimodal transportation contained in the new plan, and the acknowledgement that new and future residents are going to demand better transportation alternatives. The Board will vote on adoption of the plan at their meeting on March 3. 2.2 Expand creation of livable, walkable communities that are aligned with transportation infrastructure. Support a mix of housing types to accommodate a range of ages, household sizes, incomes, and uses for long term appeal, integration and sustainability. a. Explore creation of 20 Minute Neighborhoods where a variety of housing options and jobs are linked by high capacity transit to support clusters of opportunity and innovation. b. Initiate joint FCDOT/VDOT/ Metro/VRE actions to link housing to jobs, including new transit networks, and expanded bike-pedestrian networks. a. Implement pedestrian, bike and roadway improvements around Phase II Silver Line stations. b. Continue to fund and implement infrastructure improvements that include additional bicycle and pedestrian improvements on overpasses or tunnels and acquire easements for new trails and park greenways where appropriate. c. Continue implementation of the Bicycle Master Plan recommendations. d. Promote bike lanes in areas where they have been identified in the Bicycle Master Plan. 2.11 Support the implementation of a comprehensive “Health in All Policies” plan that integrates concepts that promote healthy living with a renewed focus on placemaking. Projects included in the plan should focus on increasing physical activity, better nutrition, and expanding access to health care, parkland, and recreation centers. projects related to pedestrian and bicycle transportation and transit. Senate Bill 1220, Following Too Closely, was voted out of the House Transportation Committee with a vote by the full House expected later this week. The identical House version, House Bill 1342, was voted out of the Senate Transportation Committee and a vote is also expected later this week. "...we have only SB781 “Crossing the Double Yellow Line” and SB882 “the Dooring bill”, both of which will be heard in House Trans Sub2 next Monday. As usual, we can use the help of our Northern VA folks to ask Del. LeMunyon’s support and our Hampton Roads folks to ask Del. Taylor’s so we can get these bills out of this Sub Committee, which would appear to be our last major obstacle." At a public meeting held last night, Fairfax County outlined various alternatives for including bike lanes as part of the repaving of Amherst Ave and Backlick Roads, the one-way pair of roads that extend parallel to I-95 just south of I-495 in Springfield. Southbound Amherst Ave is wider than Backlick Road. Buffered bike lanes are proposed between Highland St and Cumberland Ave. The proposed road profile includes a 10.5' parking lane, 5' bike lanes, a 3' stripped buffer, 3 11' lanes, and another 10.5' parking lane. On northbound Backclick Rd two options were proposed. Option A would include bike lanes from Cumberland Ave to Essex Ave where cyclists would take local streets, following Essex to Floyd Ave back to Backlick. Bike lanes would then continue on Backlick north to Lynbrook Elementary School just north of Cumberland Ave.
Option B would require parking spaces to be removed between Essex and Floyd in order to allow continuous bike lanes along Backlick and avoid an inconvenient detour. This is by far the preferred option but given the amount of on-street parking that would be removed, it will be the most difficult to implement. All the houses along the stretch of Backlick, where free on-street parking is provided, have driveways where vehicles could be stored rather than using the public street. Special care needs to be paid to ensuring that when implemented, the bike lanes are located outside the door zone. Many people park on the road and dooring could be a major problem. During the meeting one cyclist pointed out that there is a greater need for bike facilities north and south of this section of Amherst/Backlick. However the right of way is limited and it would be much more difficult to include bike lanes in a restriping project. Major changes in the road profile would be required. There is a great deal of pedestrian and bicycle activity in that area. In the Google Maps Street View image of Backlick Rd under 495 on the right you can see two pedestrians and a bicyclists in that short section. The next step for Fairfax County is to consider public feedback received at the meeting and develop a final draft proposal. The roads will be repaved this summer. Thanks to cyclists who attended the meeting and spoke out for bike facilities. It helps to have cyclists in the audience to counter statements like the one made last night by someone who said it would be too dangerous to add bike lanes in this area, even though he acknowledged that he frequently sees cyclists riding on the sidewalk in front of his house, competing with the many pedestrians for space. A similar meeting is planned for February 18 to discuss a proposed road diet on Kingstowne Blvd from Beulah Street to Hayfield Road. The meeting will be held at Kingstowne’s Thompson Center located at 6090 Kingstowne Village Parkway, beginning at 7 p.m.
Fairfax County is still seeking a replacement for Charlie Strunk, the former bike coordinator who retired in mid-January. The first announcement was issued in August 2014 and the county was not able to hire a new coordinator from applications they received. We hope it doesn't take another 5 months to go through the hiring process a second time. Capital Projects and Operations Division. Directly responsible for managing and overseeing the county's comprehensive bicycle program, including both capital and non-capital program areas and projects. Serves as the senior technical resource on all Fairfax County bicycle issues; currently supervises one Transportation Planner II. Position responsibilities include: Coordinates with other staff, agencies, and departments involved in bicycle planning, design, and construction including both public and private sectors. Develops policies and procedures to enhance and support bicycling as part of the county's multi-modal transportation policy and complete streets efforts. Responsible for bicycle project development, including coordinating and reviewing projects assigned to others. 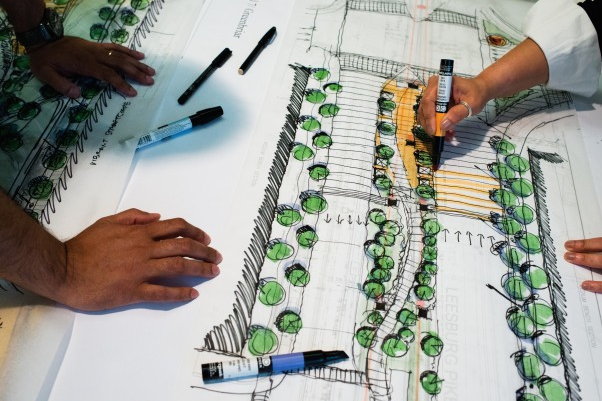 Reviews development applications and plans including rezoning applications, special exceptions/special permits, and site plans assuring that bicycle issues are addressed. Coordinates with the Virginia Department of Transportation regarding state transportation improvement projects assuring bicycle issues are addressed. Manages the county's growing bicycle parking infrastructure program, including the bicycle locker rental program and the new network of secure, enclosed bicycle storage rooms. Assists with identifying and securing funding for both capital and non-capital bicycle projects. Develops and prioritizes bicycle projects to be added to the county's transportation improvement program. Requires good oral presentation skills and writing skills to be used in working with elected officials, agency representatives, design consultants, bicycle advocacy groups, and the general public on all county bicycle-related issues. Requires attendance and participation at public meetings, public hearings, and workshops, as well as both local and regional bicycling events. Any combination of education, experience, and training equivalent to graduation from an accredited four-year college or university with a bachelor’s degree in civil engineering, urban, regional or transportation planning, or a closely related field; plus four years of experience related to transportation planning. Should demonstrate knowledge and understanding of current planning principles and practices related to the field of bicycle planning and design. Should demonstrate a basic understanding of engineering principles as they relate to the design and construction of bicycle facilities including shared use paths, on-road facilities, and bicycle parking. Should be experienced bicyclists and have general knowledge of the operations and maintenance of bicycles. Work is generally sedentary. This position requires one to be able to stand, stoop, bend, stretch, walk, climb, sit, type on a keyboard, and lift up to 25 pounds. Employee must be able to ride a bicycle. Fairfax County is holding an information meeting on proposed bike facilities on Amherst Avenue/Backlick Road from Cumberland Avenue to Highland Street. The meeting will be held on Tuesday, February 10th, in the cafeteria at Lynbrook Elementary School located at 5801 Backlick Road, Springfield, VA 22150. The meeting is scheduleed to begin at 7:00 PM. 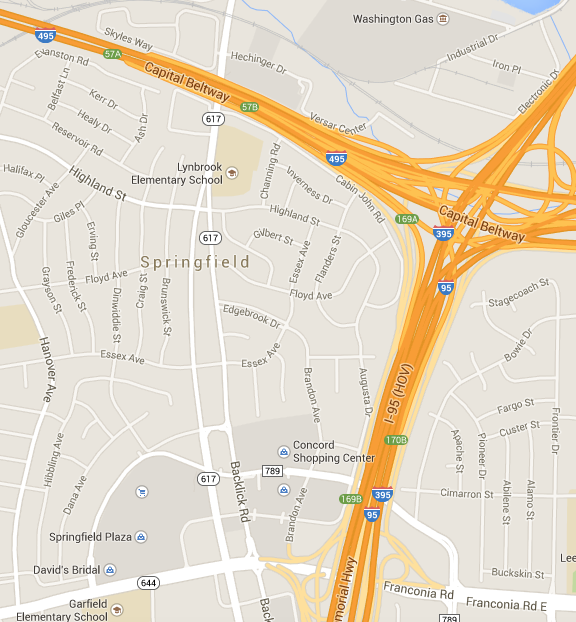 The Amherst Avenue/Backlick Road one-way pair provides important access to commercial areas in the Springfield activity cluster near the intersection of interstates 95, 395, and 495. This pair connects the adjacent neighborhoods with shopping areas and job centers such as the Shirley Industrial Park and Springfield Plaza. Cyclists in the Springfield, Franconia, West Springfield, and Annandale areas are encouraged to attend the meeting and support this project. VDOT recently convened a group to review the NoVa Bikeway study to determine which projects have been completed and how to move other projects forward. We'll write more about that effort in the near future. I am writing to urge you to ask the Virginia Department of Transportation (VDOT) to provide bicycle and pedestrian accommodations as part of the I-66 Corridor Multimodal Solutions project outside the Beltway. Over 450 Fairfax County cyclists contacted VDOT asking them to include these bike facilities as part of the project. This is a once in a generation opportunity to make this corridor truly multi-modal by providing grade-separated trails parallel to I-66 that would be an extension of the Custis Trail, and ensure safe and accessible bike and pedestrian connections to transit and at all I-66 crossings. VDOT knows that simply adding lanes to I-66 will not solve existing congestion problems. Enhanced transit, high occupancy toll lanes, Transportation Demand Management (TDM), and bicycle and pedestrian facilities are all needed for true multimodal solutions. As we've seen with the Silver Line, safe bicycle and pedestrian access to transit is critical for reducing congestion and promoting biking and walking to the stations. We need to begin planning now to ensure safe, connected facilities for people walking and biking to future transit stations. Otherwise, transit and TDM solutions will not be effective. The provision of a bicycle trail that serves the I-66 corridor outside of the Beltway, which is included in the County's transportation plan, would provide bicycle accessibility to large portions of Fairfax County and beyond. Furthermore, this trail and/or future extensions of this trail would provide interconnectivity to other bicycle facilities planned in both Fairfax and Prince William Counties and allow for opportunities to provide crossings of I-66 with exclusive bicycle/ pedestrian bridges or underpasses. A multi-use trail along I-66 would provide solid steps in support of both the Fairfax County Bicycle Master Plan and the Countywide Trails Plan. The County Bicycle Master Plan that you and the other Board Supervisors unanimously approved in November calls for a trail on the north side of I-66 between the Beltway and Route 50. Additionally, the Countywide Trails Plan recommends a Major Regional Trail along I-66. VDOT can support the County by providing a mulit-use trail along the I-66 corridor. These I-66 multi-use trails would connect with the Custis Trail that extends along I-66 inside the Beltway. Over 600,000 bicycle trips were recorded on bike counters on the Custis Trail last year. The Custis Trail is a major bicycle facility that was built with a very narrow profile on one side of the highway, in many places adjacent to the sound barrier. We need to extend the Custis Trail outside the Beltway in a similar manner, and now is the time to build it. I ask for your support to ensure these bicycle and pedestrian facilities are included in the I-66 project outside the Beltway. 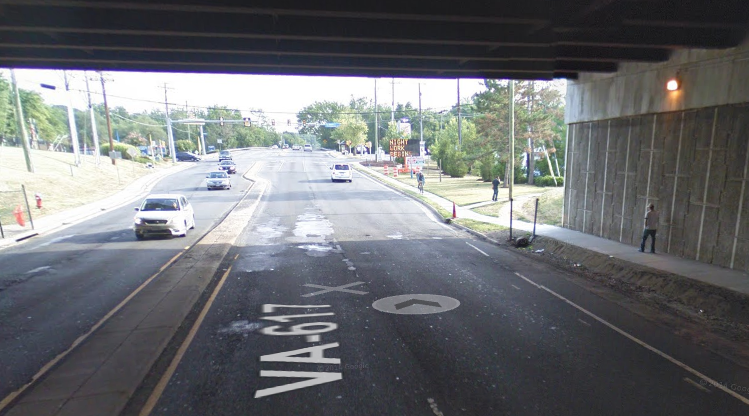 Please insist that VDOT include a multi-use trail along the corridor and provide safe, accessible connections to transit and at all I-66 crossings. I appreciate your time and consideration. Feel free to contact me at 703-328-9619 if I can provide assistance in any way. Tonight is the last of four meetings on the I-66 Corridor Multimodal Solutions project outside the Beltway. The meeting be held at VDOT Northern Virginia District headquarters, 4975 Alliance Drive, Fairfax, VA 22030, from 6-. Cyclists are urged to attend this meeting to learn more about plans for bike facilities on the bridges across I-66 that will be rebuilt to allow expansion of the roadway, and to ask that the Custis Trail be extend outside the beltway as a parallel trail along I-66. See the FABB I-66 Info Page for supporting information on why it's important to include bicycle access through the heart of Fairfax where east-west bicycle access is poor and population is relatively dense. Tuesday, February 3, at Oakton High School in Vienna from 6:00 p.m. until 8:30 p.m.
Thursday, February 5, at the VDOT Northern Virginia District Office in Fairfax from 6:00 p.m. until 8:30 p.m. Bicycle facilities need to be part of proposed changes to the I-66 corridor, to provide a non-motorized alternative for taking short trips and to provide commuters a way to connect to Fairfax City, the Custis Trail, the growing Merrifield area, and points west. The trail could also be an important recreational asset for this populated central part of Fairfax that lacks a good east-west bicycle facility. We're urging cyclists to attend these meetings and ask about the status of bike facilities on all of the bridges across I-66 and a parallel trail along I-66 similar to the Custis Trail inside the Beltway. For more information on the need for bike facilities in this corridor see our web page on I-66 Bicycle Facilities: 495 to Haymarket.